AIRLINE NEWS . 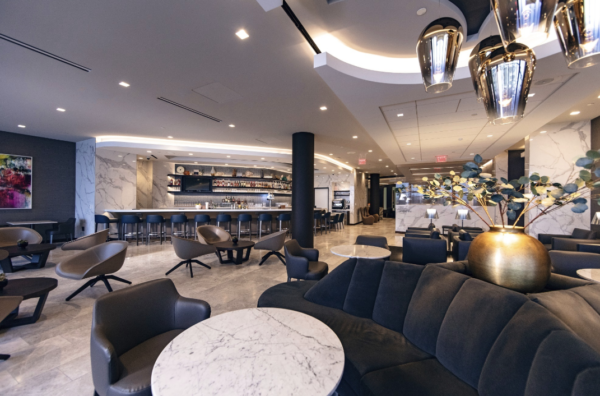 . .
United Airlines’s fifth Polaris lounge, located at Los Angeles International Airport (LAX), will open tomorrow, capping off the completion of the airline’s $573-million revamp of Terminal 7. The lounge, available to United’s Polaris international business-class travelers, marks the company’s shift in focus that began with president and CEO Oscar Munoz’s vision for change, when he returned to work after a heart transplant in 2016. According to Janet Lamkin, president of United California The Polaris concept began with United’s proprietary lie-flat seat that boasts a 6-foot-6-inch bed space, which the company has already installed in 47 wide-body planes, including in the 787-10, which was our first 787 to have the Polaris seat on it. The lounge’s 140 seats include signature seats designed to mimic the Polaris airplane seat, with extra privacy for the solo traveler. Each private seating area has an oversized chair, a table, numerous power outlets and a personal lamp. There are also modern padded couches or an ultra-modern chair that looks west out onto the jetway. The lounge features a dining room where travelers can be seated and order from a full menu of a la carte items. The menu will change seasonally; the current menu, which was created by LA chef Tritia Gestuvo, included fish and chips, chilaquiles, bulgogi arancini and street tacos. The new Polaris lounge also features six shower suites and two quiet suites (where taking a nap is encouraged), each tricked out with high-end amenities and luxury bedding. And probably the most important feature of all is that every seat has easy access to power ports – 272 in all, as well as 120 USB ports..
Demand has doubled: homologations of Pirelli tires equipped with innovative PNCS technology numbered 78 by the end of 2017. One year later, the figure increased by 100%, now making a total of more than 150. This system created by Pirelli has been on sale since 2013 and is increasingly requested by the world’s best-known carmakers, especially those in the premium and prestige sectors, to offer greater comfort to drivers and passengers. PNCS stands for Pirelli Noise Cancelling System. This technology is designed to reduce perceived noise on the inside of the car, derived from the interaction between the road surface and the tire itself. Thanks to Pirelli’s PNCS, this road noise can be reduced by up to 25%, as if the car were travelling on only three wheels. It’s made possible thanks to the use of a specific sound absorbing material placed within the tire, which absorbs vibrations in the air that would otherwise be transmitted to the inside of the vehicle, creating annoying background noise. This ‘sponge’ is made from foam consisting of open cells that maximise the working surface of the material, intensifying the deadening of vibration, and therefore reducing noise. Tires equipped with this technology can be recognised by special markings on the sidewall, which depict a speaker and soundwaves with a bar through them, next to the PNCS symbol. Owners of vehicles equipped with PNCS technology are advised to always buy appropriately marked tires specifically made for their cars, in order to continue to enjoy the advantages of this relaxing technology. Of course, it’s also important to look after the tires properly: maintaining the correct tire pressures as advised by the manufacturer also helps to contain road noise.